The upcoming movie of Shah Rukh Khan called Zero is all set to release next month. Not many knew that the film has the song with late actress Sridevi in it. The film was announced in 2016 and soon went on the floor having enough time to rope in the late actress by the makers for a special song in it. The movie is having Anushka Sharma and Katrina Kaif in it who would be seen again with SRK after Jab Hai Jaan produced by Yash Raj Films. The trailer of the film was released on SRK’s birthday on 2nd November 2018, which has gained a good response from the audience. The film is made in collaboration with Anand L Rai and SRK production company Red Chillies Entertainment. The film happens to be larger than life movie, which has many of the B Town celebrities making their cameo in it including the late actress as well. The others include Karishma Kapoor and Alia Bhatt. 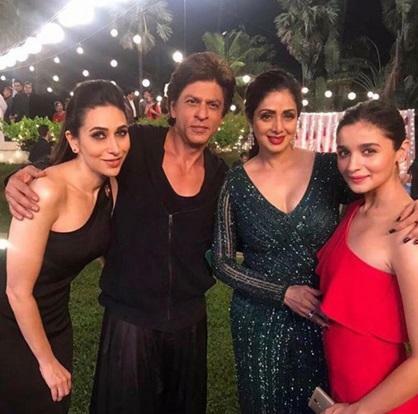 As per reports, the special song with the later actress Sridevi and other actresses would be only seen in the film when it finally releases. The makers had kept the song under the wrap and release the same with the film like a surprising thing. The makers, however, have released their first song called Mere Naam Tu, which happens to be a romantic track as released by them. The song has witnessed a whopping amount of views ever since it was released in the social media and YouTube. It featured Shah Rukh Khan’s character called Bauua Singh and Aafia on wheelchair played by Anushka Sharma. The song was romantic, and people really liked it. The film is releasing on the eve of Christmas on 21st December 2018. The makers are yet to disclose any detail about the special song with Sridevi and other actresses in the B Town. Stay tuned to know more about this film and others only with us.